For other uses, see Taxandria. Toxandria in a map of Western Europe (919-1125). The Toxandri (or Texuandri, Taxandri, Toxandrians etc.) were a people living at the time of the Roman empire. Their territory was called Toxandria, Toxiandria or Taxandria, a name which survived into the Middle Ages. It was roughly equivalent to the modern Campine (Dutch Kempen) geographical region of northeastern Flanders and southern Netherlands. In modern terms this covered all or most of North Brabant, the east of Antwerp Province, and the north of Belgian Limburg. Their name is also preserved in modern placenames such as Tessenderlo, which is in the modern Belgian province of Limburg where it borders upon the provinces of Antwerp and Flemish Brabant. Pliny the Elder in his Naturalis Historia reported that they were divided into "various peoples with many names". He placed them at the extreme edge of Gallia Belgica, the River Scaldis (modern Scheldt) which some translations interpret as being "beyond" that river, with the Menapii on the more Roman side. This means that the Texuandri were either within, or very close to, the part of the river delta frontier area of Belgic Gaul, that later became part of Roman "Lower Germany". The coastal Menapii and Morini were west of the Scheldt, and so the Texuandri were likely on the eastern bank north of modern Antwerp, in or near the area known as Toxandria in the Middle Ages. From military records around the empire it appears that the Texuandri may have formed at least one administrative district or "pagus" which contributed troops to Roman armies, but it appears to be associated with more than one higher level district. One is the Civitas Tungrorum, the civitas of the Tungri, but there also seems to be an association with the civitas of the Nervii, to the west. The modern town of Tongerloo, named after the Tungri, is very close to Tessenderlo, but actually further from the city of the Tungri which is modern Tongeren. The relationship between the Tungri and Toxandri is unclear. Alternatively, the Toxandri and Tungri, whose name also only appears for the first time in Roman times, may have been made up of Germanic immigrants from the east of the Rhine, settling Roman territory, as certainly happened closer to the Rhine - for example the Ubii to the east near Cologne, the Cugerni to the northeast near Xanten, and the Batavians and Canenefates directly to the north of the Toxandri, in the Rhine-Meuse delta. Tacitus does not mention the Toxandri, but specifically mentions that the Tungri, unlike the Ubii, Batavians and Canenefates, had simply changed tribal name, having previously been known as the (cisrhenane) Germani, a grouping which had included the Eburones. Before the takeover of Rome in this region, in Julius Caesar's commentary tribal boundaries in the area where the Toxandri are later found are left unclear. It is generally described as thorny low forest and marshy lowlands, northwards of main populations of the cisrhenane Germani and Nervii. Caesar mentions both these politically important tribes retreating into estuarine areas, but more clearly connects those regions to the Menapii, who in Caesar's time, as opposed to Strabo's, stretched through the delta all the way to the Rhine. At one point Caesar specifically says that the cisrhenane Germani bordering the Menapii were the Eburones, who he describes as the biggest and most important tribe of the Germani. In one isolated passage, Caesar did apparently describe a tribe in the area of the later Toxandri, the Ambivariti. He describes their position incidentally only, mentioning that a raiding group from Germany had crossed the Rhine at a point where Menapii lived on both sides of the river, and then crossed the Meuse (Dutch Maas) in order to raid the Ambivariti. But this tribe is never mentioned by any other known classical source, and Caesar does not describe the associations of these people with any others. In the middle of the 4th century, the area of Toxandria became very de-populated, and was exposed to constant raiding from tribes across the Rhine, outside the empire. Having been amongst the worst raiders, the Salian Franks were eventually settled as foederati in Toxandria. Julian the Apostate had at first fought against Saxons and Franks, including the Salians, but then allowed this one group "descended from the Franks" to settle in Toxandria in 358. According to Zosimus, in the years previous to this agreement, the Salians had already settled in the island of the Batavians, a border island of the Roman empire, forced there by Saxons from northern Germany. But they had come under attack from Saxons, who were this time raiding Roman territory (and the Salians) from the sea. "[Julian] commanded his army to attack them briskly; but not to kill any of the Salii, or prevent them from entering the Roman territories, because they came not as enemies, but were forced there [...] As soon as the Salii heard of the kindness of Caesar, some of them went with their king into the Roman territory, and others fled to the extremity of their country, but all humbly committed their lives and fortunes to Caesar's gracious protection." The Salians then became Roman allies (foederati) and provided troops for the imperial army, in the very period that Roman influence in the area was weakening. 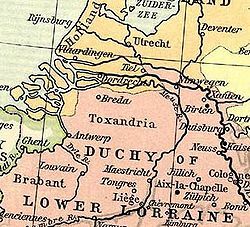 Toxandria therefore eventually became the name of a Frankish county in early medieval Lower Lotharingia. Texandria is mentioned as a large county in the 870 Treaty of Meersen, and remained the name of a large diocese of the Catholic church during the Middle Ages, under the Roman Catholic Diocese of Liège, which was originally conceived as the diocese of the Roman administrative area of the Tungri. ^ a b Wightman, Edith Mary (1985), Gallia Belgica, University of California Press , page 53-54. ^ Tacitus, Germania, II 2. ceterum Germaniae vocabulum recens et nuper additum, quoniamqui primi Rhenum transgressi Gallos expulerint ac nunc Tungri, tunc Germani vocati sint: ita nationis nomen, nongentis, evaluisse paulatim, ut omnes primum a victore obmetum, mox et a se ipsis invento nomine Germani vocarentur. Tongeren is a city and municipality located in the Belgian province of Limburg, in the southeastern corner of the Flemish region of Belgium. Tongeren is the oldest town in Belgium, as the only Roman administrative capital within the country's borders. As a Roman city, it was inhabited by the Tungri, and known as Atuatuca Tungrorum, it was the administrative centre of the Civitas Tungrorum district. The city is a member of the Most Ancient European Towns Network. Gallia Belgica was a province of the Roman empire located in the north-eastern part of Roman Gaul, in what is today primarily France, Belgium, and Luxembourg, along with parts of the Netherlands and Germany. The Menapii were a Belgic tribe of northern Gaul in pre-Roman and Roman times. According to descriptions in such authors as Strabo, Caesar, Pliny the Elder and Ptolemy their territory had stretched northwards to the mouth of the Rhine in the north, but more lastingly it stretched along the west of the Scheldt river. In later geographical terms this territory corresponds roughly to the modern Belgian coast, the Belgian provinces of East and West Flanders. It also extended into neighbouring France and the river deltas of the Southern Netherlands. The Condrusi were a Germanic tribe of ancient Belgium, which takes its name from the political and ethnic group known to the Romans as the Belgae. The Condrusi were probably located in the region now known as Condroz, named after them, between Liège and Namur. The terrain is wooded hills on the northeastern edge of the Ardennes. The Tencteri or Tenchteri or Tenctheri were an ancient tribe, who moved into the area on the right bank of the lower Rhine in the 1st century BC. They are known first from the surviving works of ancient authors such as Julius Caesar and Tacitus. In December 2015, archaeologists found remains of the Tencteri in The Netherlands. The Belgian province of Limburg in Flanders is a region which has had many names and border changes over its long recorded history. Its modern name is a name shared with the neighbouring province of the Netherlands, with which it was for a while politically united. And in turn both of these provinces received their modern name only in the 19th century, based upon the name of the medieval Duchy of Limburg which was actually based in neighbouring Wallonia, in the town of Limbourg on the Vesdre.